Benvenuti a Roma! We are pleased to offer complimentary transfers from the Rome Airport to your hotel at scheduled times. Your Perillo representative will be at the airport to greet you. Enjoy some free time this afternoon - take a walk on Via Veneto, have a gelato or maybe do some shopping. Tonight, we'll meet our tour leader for a brief orientation and welcome drink, followed by dinner in our hotel. This morning, after breakfast, we travel to Bologna, the gastronomic capital of Italy. To Italians, Bologna is known as the city of "Two Towers"; worldwide it's known as the city of lasagna, tagliatelle, tortellini and Bolognese sauce. Good food must boost brain-power because Bologna is home to the oldest university in Europe! This afternoon is yours to enjoy on your own. Why not visit the market stalls selling beans, tomatoes and cheeses. Have lunch at a trattoria serving fresh pasta with their signature ragu sauce. The city is a food lover's paradise! Tonight, we enjoy a fabulous dinner with typical local specialties in our hotel. This morning, we travel to Parma, city in the region of Emilia Romagna famous for its prosciutto, parmigiano cheese, architecture and gorgeous countryside. On the way, we'll stop to visit a cheese factory for a taste of genuine parmigiano cheese - our favorite! In Parma, we'll enjoy a visit to a prosciutto (ham) factory followed by a light lunch. This afternoon, we return to Bologna where we will enjoy a Gelato lesson with tasting along with a museum tour! Instructions from Carpigiani Gelato University will teach us how to transform fresh fruit into a delicious gelato that we can make at home! During the workshop, we will get to taste a delicious flavor of gelato. After the leson, you will receive your very own diploma - you'll be gelato master after this! Tonight, enjoy dinner on your own. Be sure to try one of Bologna's signature dishes: tortellini, which take their shape from Venus' navel! The Grand Canal is just-short train ride away. Should we go? You shouldn't want to miss one of the most unique cities in the world... Andiamo a Venezia! In Venice, everything and everyone floats. One floats luxuriously with such a sense of freedom, never tormented by traffic or even the sounds of honking horns. Your guide will show you all the sights - St. Mark's Square, the Basilica and the Bridge of Sighs. Just around the corner from St. Mark's Square, we'll enjoy a special Venetian lunch in a city renowned for its seafood specialties. This evening we return to Bologna for dinner on our own. Excitement awaits!! Today we visit the Cinque Terre, the ruggedly beautiful stretch of coastline inset with five tiny villages perched along the Italian Riviera. These 5 picturesque fishing villages are often the "top places to visit" for most travel magazines. First, we travel to La Spezia to board our train to tiny Vernazza, the jewel of the Cinque Terre. Here the way of life remains simple, unspoiled and without cars. Ah... Tranquility! We continue on to Rapallo, a pretty seaside resort town on the Italian Riviera. After a short visit of the city center, we check into our beautiful hotel and enjoy dinner with fine local wines. After a leisurely breakfast, we take a short boat ride to Portofino, a picturesque seaside village with brightly colored houses lining the shore. Portofino is also known as the resort of the rich and famous... a perfect place for our guests! Designer boutiques and dozens of cafes and restaurants line the main square, giving guests the chance to experience the real Italian "bella vita" *Weather Permitting You'll have free time to visit the main square, the church of San Giorgio, which is said to have relics of St. George. You can also visit the Brown Castle, built in the 15th century and used for harbor defense over the centuries. We next visit Camogli, another charming fishing village and resort. This town has a small harbor with shops and restaurants. You'll have some free time to sightsee, have a gelato or just sit and people watch. Later today we return to our hotel in Rapallo to enjoy the evening on our own. Today we drive to Stresa on beautiful Lake Maggiore. For centuries, Stresa has been a popular retreat for Europe's aristocrats who have endowed the town with a number of beautiful villas. Next, we visit Isola Bella, "beautiful island," one of the Borromean islands of Lake Maggiore. With its wonderful gardens and impressive palace, this lovely island will remain in your memory forever. After checking into our beautiful hotel in Stresa, enjoy one of your last dinners in Italy on your own. Time to really indulge! This morning we enjoy an excursion to Lugano to explore the Italian section of Switzerland. Its close proximity to Italy makes the city a wonderful blend of Italian charm and Swiss sophistication Stroll along the charming arcades, admire breathtaking lake views and, most importantly, shop for Swiss chocolate! Next, we enjoy a boat ride around Lake Como, widely regarded as one of the most beautiful lakes in Italy. Many celebrities have homes on the shores of Lake Como - George Clooney, Gianni Versace, Sylvester Stallone and Madonna. Real estate offices will be open for your convenience! Tonight, we have a final dinner in the hotel with our new travel friends. Don't forget to exchange email addresses and make plans for the future. How about you all meet again on another Perillo Tour - to Hawaii! Transfer to Milan Airport in time for your return flight to USA. 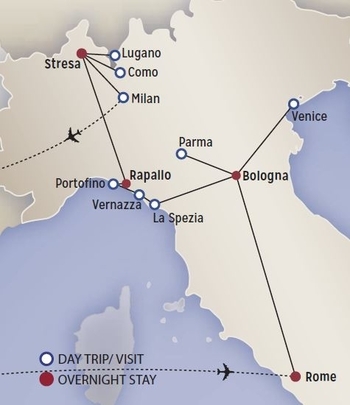 Full Day Venice Excursionincluding lunch. Note: AffordableTours.com is a travel agent for Perillo. All prices, itineraries, accommodations and dates are subject to change without notice and at any time by the tour operators. All prices are USD per person and based on double occupancy. Availability is limited and must be reconfirmed at time of booking. Please call us toll free at 1-800-935-2620 to confirm availability and current pricing on all our discounted specials. The prices on this website are not guaranteed until a deposit has been made. We are not responsible for errors, omissions, or changes in these prices until a booking has been confirmed by one of our agents. Some land prices may include an internal air component and discounts will not be offered on the internal air component. Discounts will not be offered on packages with a land price of less than $500.